Red carpet season is full of wow moments, but there's very little that can translate from the spotlight and into one's regular, day-to-day wardrobe. We can all appreciate and dream of a frothy tulle gown worn with treasure chest's worth of diamonds, but it's fairly unlikely we'll replicate the vibe for an 8:30 a.m. client meeting at Pret a Manger. So whilst much of the world's focus is on Lady Gaga and her glamorous evening attire right now, we're shifting the focus slightly to analyse A-listers and their off-duty attire. January is a time to rethink the structure of your wardrobe rather than going wild in the aisles, stocking up on all of the things you definitely don't need in a bid for feeling new and revitalised. Instead, we're urging you to consider the staples that are missing from your closet—imagine it as the prep work behind looking sophisticated for the rest of the year. We're talking about the silent heroes that make getting dressed a thousand times easier and last far longer than a flash-in-the-pan trend. The clever jackets that work with countless outfits; the smart shoes that never fail you; the feel-good denim pieces that don't date. See the elevated basics celebrities love to rely upon below, and you'll be pleasantly surprised by how many of them you probably own already. 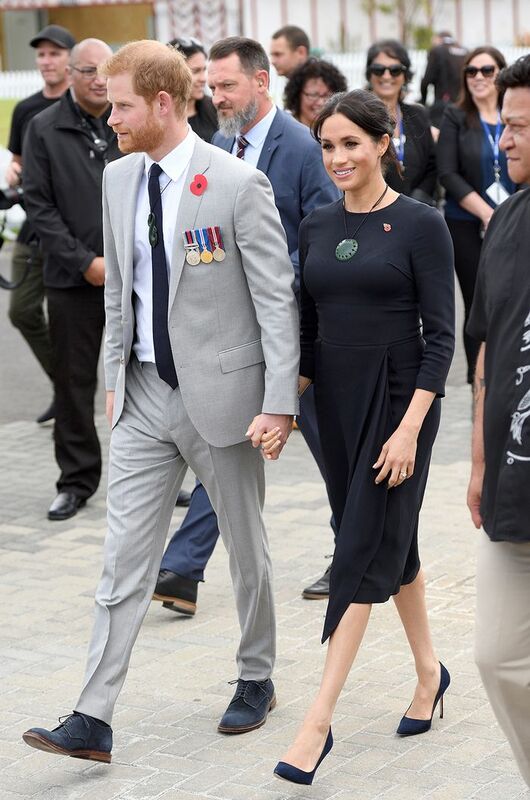 Style Notes: There are many key items Meghan relies upon time and again, but court shoes are a mainstay for the royal, with these Manolo Blahnik BB pumps being one of her most reliable options. She owns them in navy, black and beige suede. Style Notes: Where would the Olsen twins be without their armoury of black clothes and accessories? It's all in the subtle details—the toe of a boot, the exaggerated buckle on a belt, or the curve of a stiletto. Nothing about these items is average-looking despite being plain and simple. Style Notes: Every time SJP leaves her NYC home she's always in a midi dress—whether floral or plain, glitzy or cosy, there appears to be no end to her useful dress catalogue. Style Notes: No celeb worth their starry-status salt would ever be spotted on the circuit without a pair of shades. I like how Zoë always keeps things quite classic with her frame choices—there's no need to go OTT. Style Notes: Adwoa's adept at blending streetwear essentials with fancy designer items—and even makes a classic bomber look interesting by the way she's styled it across one shoulder. Style Notes: Sienna's cold-weather wardrobe revolves around well-chosen accessories, comfy shoes and a selection of classic coats like this camel crombie or a plain parka. Style Notes: Often spotted in delicate floral dresses, Margot always opts for a tougher-looking crossbody bag to give her dainty looks a bit more bite. We can't all own a pearl-studded Chanel Flap, but we can take the idea. Style Notes: Jen An has been wearing her trusty leather trews for well over a decade—a perfect switch-up option when you're bored of black jeans. Style Notes: When your hair is slicked back and your makeup is looking fly, what better way to frame your face than with a pair of gold hoops? J.Lo knows it, Kendall knows it, and I know it. Style Notes: When EmRata isn't in a bikini or a barely there dress, she's very good at doing casual. Her straight-leg jeans can be worn in so many ways, but we appreciate this cold-snap look with its nerdy socks, hiking books and cropped jacket. Style Notes: So much to love about this tailoring and athleisure combination from the forever-awesome, Tracee Ellis Ross. Wearing joggers with a blazer never seemed so doable before, but we think we'll try it for a Dress Down Friday. Style Notes: Some fashion staples die hard, and Converse's classic All Star high-top sneaks are still a celebrity favourite in 2019. Thanks for the reminder, Hailey. Style Notes: I adore everything about this low-key look (especially that giant coat and the shiny flat boots), but it's good to note that a tan bag goes with EVERYTHING. Style Notes: VB's wardrobe is a masterful blend of unfussy items (see the roll neck and shades) with trend-ticking ones (burgundy knee boots and leather skirt), proving that you sometimes really need to lean on staples to pull off a fresh idea. Style Notes: Yara's double-denim formula has been favoured by celebs across the globe, but there's something even cooler and more off-beat about the oversized silhouette and buttoned-up shirt she's tried out here. Style Notes: What else to wear with a baroque-inspired puffer coat than some fierce black skinny jeans, high-high boots and reflective sunnies? Lupita, you are a babe. Style Notes: With a faux-fur coat and embellished pumps, Alexa has made us entirely rethink the concept of a wearing a hoodie on a night out. Style Notes: High-fashion puffer jackets have fallen into the mainstream, and we like how Bella has souped hers up with a vanity-case handbag, ponytail and hoop earrings. Very brunch-ready. Style Notes: We all know Willoughby likes a good pair of sturdy ankle boots, wearing them with everything from flippy mini dresses to this all-black winter ensemble. Next up, the 20 items you should own by the time you're 30.